MÜNSTER -De Germania Ursina ciuitas, uulgo Bernensis, ad hunc Christi annum 1549. exarata. MÜNSTER, S. - De Germania Ursina ciuitas, uulgo Bernensis, ad hunc Christi annum 1549. exarata. 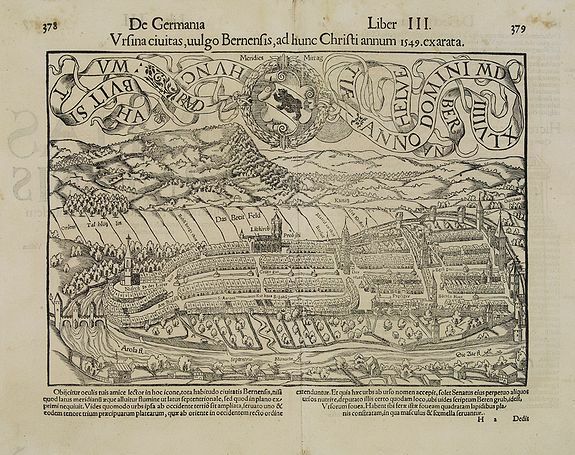 De Germania Ursina ciuitas, uulgo Bernensis, ad hunc Christi annum 1549. exarata. - MÜNSTER, S.
Title : De Germania Ursina ciuitas, uulgo Bernensis, ad hunc Christi annum 1549. exarata.. Size : 8.3 x 11.8 inches. / 21.0 x 30.0 cm. Description :Early bird's eye view of Bern. Condition : Double page woodblock print with letter press.